UPDATE: This post was penned in the Spring of 2011 following our visit to Syria in March. We had no idea the direction the conflict would take. When we planned our trip Syria had been undergoing an opening up to tourism. Yes, there were protests while we were there but it seemed like the beginning of an Arab Spring. We naively hoped it might be a positive transformation rather than a descent into chaos. Another of the experiences on our recent trip, let me know if you're enjoying the narrative? Apologies for not blogging the trip in the order in which we travelled. I realize it's disconcerting to see my posts jump from place to place, but I've chosen to write posts that follow my interests, rather than a chronological ordering of our route. I may reorder them all later. On to the tale... we hired a taxi to drive between Damascus and Amman, stopping at Bosra (Syria) and Jerash (Jordan) on the way; this was money well spent. 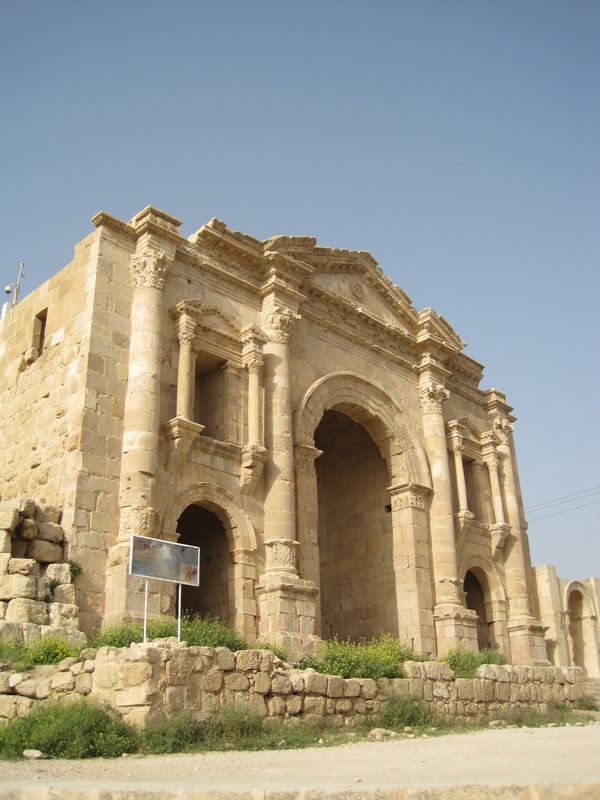 A significant stop on the trade routes, Bosra became the capital of the Nabatean kingdom after Petra and evolved into an important Christian center in the Byzantine period. But what is most interesting to see is the fortification of the Roman theatre. Considered a fine example of Arab military architecture, it was repurposed as a citadel in the 11th century. Strengthened by Saladin, it withstood both Mongol and Crusader attacks. You can see the unusually high fortress walls in the picture below. 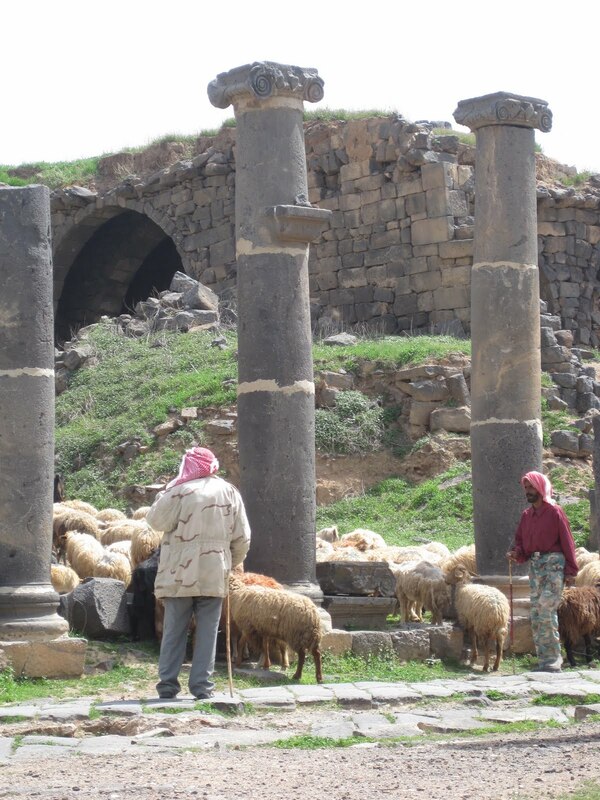 Bosra is built from black basalt and you can see the color of the stone in the picture. After Apamea, Baalbeck and Palmyra we were accustomed the light, bright stone we had seen everywhere else. The color of the stone, combined with the heavy fortifications give the theatre a monumental quality. It is enormous and the steps are both shallow and steep. There was a single French group when we arrived and we waited for them to leave. As they trailed out we sat in the sunshine and took in the view in silence. I sat in one of the back rows while Dave went down to the stage and quoted Shakespeare, much to the amusement of two other tourists who wandered in! The acoustic were fabulous. The locals live and work among the ruins! Jerash is spectacular and is said to be one of the best preserved provincial Roman cities. As usual, we arrived later than we intended, having spent too long admiring Bosra. As we drove from the Syrian border, the area seemed heavily agricultural and we came down into Jerash through hills covered in olive groves. It's a fascinating drive; two Roman cities, three Roman theaters and a straightforward border crossing makes for a wonderful day of travel. Like Petra, Palmyra and Apamea, Jerash's wealth was built on trade and like Bosra, it drew from the rich agricultural land around. 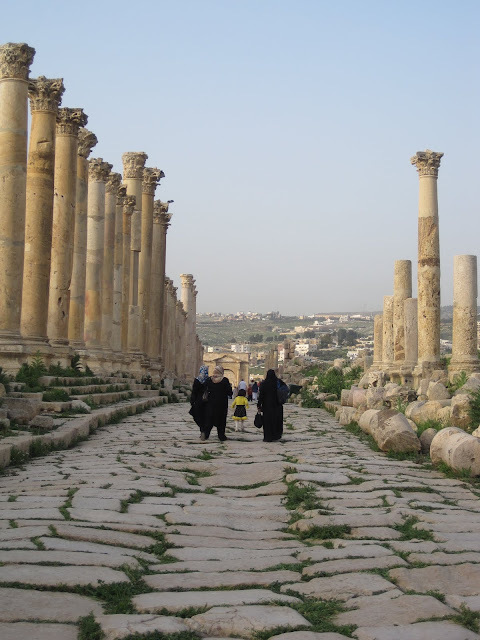 However, unlike Bosra where a pattern of continuous settlement means the locals continue to live in, and around the ruins, in Jerash the ancient city lies across from the modern town. Its entrance is marked by Hadrian's Triumphal Arch and close by there's a hippodrome where they reenact chariot races. This is a wonderful site, well worth seeing for those interested in Roman architecture. The second theaters in Jerash, and the third we saw that day! At the first theatre in Jerash the guide directed us to stand in front of the audience. There was a small indentation in the stone from a millenia of wear. It was extraordinary, you could feel the resonance of your own voice, as if you were listening to yourself on tape. It disappeared completely if you moved fractionally to the left or right. We had to flee the theatre when a busker on the bagpipes started up. The British Empire has a lot to answer for when we're forced to run from the bagpipes in Jordan! There are so many mediocre guides that sometimes you think it's better to see a site on your own. But, as the Lonely Planet points out, in places like Lebanon there have been so few tourists over the last decade that you really should support the local guides. However, once in a while you run into a guide with both a depth of knowledge, and the enthusiasm to convey it in a meaningful way. 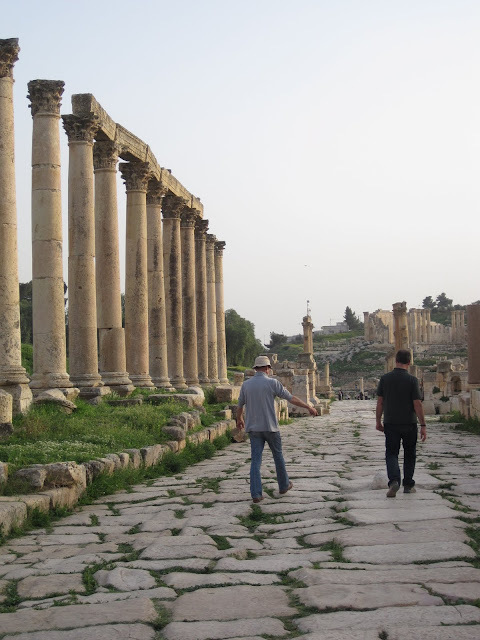 We were thrilled to run into Mohammed, one of the licensed guides at Jerash. He was great company and his overview enliven the ruins; we highly recommend him. There is a standard charge for the guides. You enter the site at the visitor's center, walking past the triumphal arch and the hippodrome. On your left is a restaurant and on the right the guide's office. They seem to work on a rotation, but you may be able to get Mohammed if you ask for him by name. He's a skinny older guy with a white beard and a twinkle in his eye.